I first started out as a visual artist and studied fine art at multiple schools including NSCAD University, ACAD and the Anna Templeton Centre. I will always continue to paint, however floristry allows me to be close to nature while providing me with a creative outlet. To me, Floristry is the marrying of my two loves and life passions: art + nature. When I was a little girl, I was always so intrigued by my Mom's dried floral arrangements that she made as a hobby. I would also help my Dad make wreaths and pinecone centrepieces for family and friends during Christmas. I first started working in the floral industry over a decade ago. I had just moved to Calgary and applied to work in the neighbourhood flower shop. I absolutely loved it! The head designer there noticed and took a special liking toward me, getting me to help her create small floral arrangements and wrapped bouquets for the display cooler. I eventually went back to studying fine art again. While in NSCAD I would find myself always incorporating natural elements like dried grasses in my work or doing studies of trees, flowers and feathers. All of my instructors would comment on this too! Haha. What inspired you to move forward in your career? I worked at about five flower shops before I started my own business, one of which I had been managing. I was scared in the beginning to take the leap from employed to self employed. It seemed like such a big step, but I knew that's what I wanted to do. I had just finished my Diploma of Floral Design at a private career college in Toronto. There they not only taught us floral design, but also how to start a flower shop. This gave me the confidence I needed and about a year later Sakurah's Flower Studio was born. What is your favourite part of working in the wedding industry? I really enjoy specializing in florals for weddings and events. I love working one on one with my clients to come up with new ideas and it brings so much satisfaction knowing that I was able to help them celebrate one of the happiest times in their life! 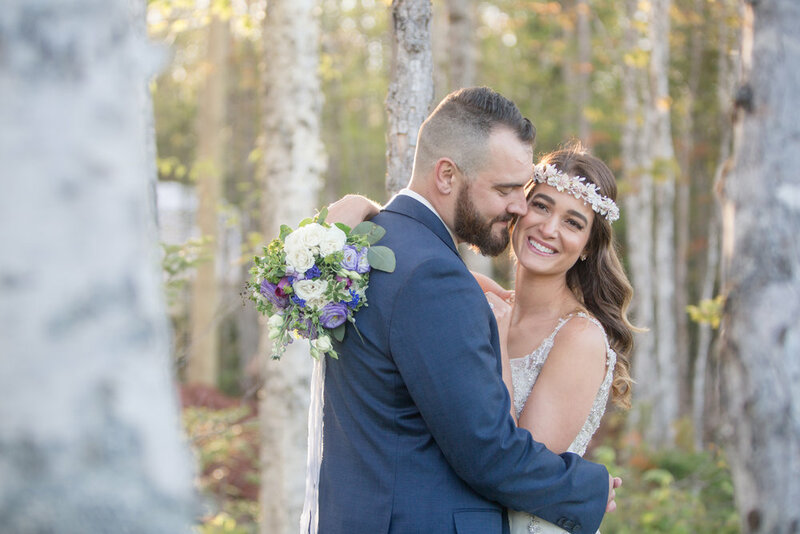 I also like to do weddings and events as they allow me to fully explore a cohesive colour palette and theme by creating a wide variety of items like garlands, arch decor and flower crowns. Sakurah's Flower Studio has been steadily growing every year and I am so thrilled and thankful to be able to call this my career! Over the last couple years I have given thought to having a sister decor business offering draperies and other accents for events, but no real plans as of yet. I also started a small flower farm two seasons ago where I grow more specialty accent flowers along with some popular wedding flowers. I will be expanding my farm further again next season. It gives me pride to be able to use flowers that I grew from tiny seeds, and it allows me to offer a broader selection of blooms to my clients. What is the best way for couples to get in touch with you? Through email, social media, a phone call, whatever the couple is most comfortable with! If I had to choose, I guess email is probably my personal favourite. It's easier to copy and send forms, plus email software is tailored to typing longer and more detailed messages. I take bookings up to 2 years in advance. Popular dates are usually booked up about a year in advance, however a lot of my bookings happen 6-9 months before the wedding date. I think that if you know you really like a vendor and want to have them help you with your wedding details, it's a good idea to book them soon. What is your favourite type of bouquet or flower to work with? It's so hard to pick a favourite flower when you are 'under the floral spell' haha, but lately I have been drawn to arrangements with large romantic blooms like garden roses and dahlias. I love loose, lush and flowing arrangements that look like they have been freshly picked from the garden, or inspired by a floral still life painting. Thank you for your time Sakurah! Sakurah's arrangements are always beautiful and you can often find her at artisan markets with arrangements and the CUTEST little succulents!